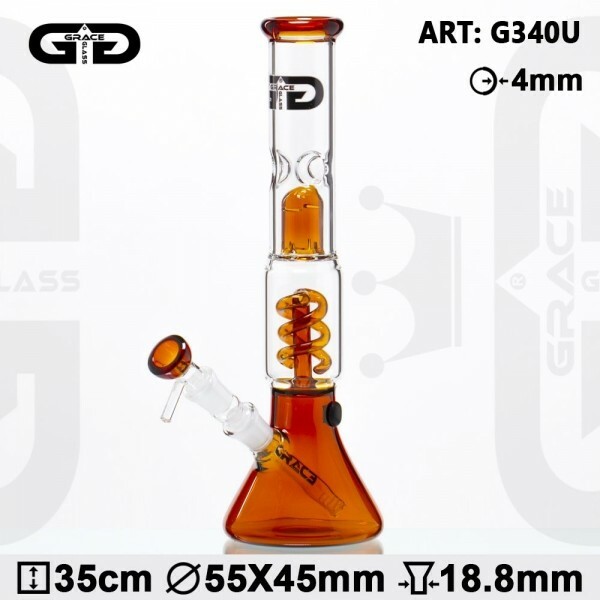 This umber Beaker Grace Glass Bong is a fine piece of glass art that will blow your mind! It comes in red accents upon the robust heat proof borosilicate glass, formed in the shape of a flatbottomed tube. You can place your precious herbs or tobacco onto the detachable umber bowl, coming with a handle that makes it easier to lift up and clean at your convenience. The bowl connects to a detachable chillum through a sure ground of 18.8mm diameter. With the black Grace Glass logo featuring at the front of the tube on top, the whole set-up ends up in an umber mouthpiece ring for a more pleasant flavor.